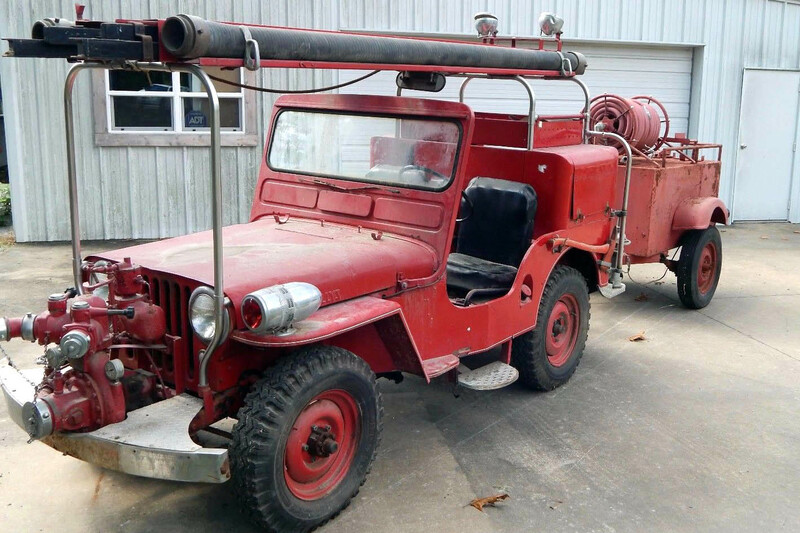 The Model BJ Jeep Fire Engine built by the Boyer Fire Apparatus Co. of Logansport, Indiana, moved from a CJ-2A platform to a CJ-3A platform toward the end of the company's association with Willys-Overland. I don't have numbers for their output of CJ-3As, but surviving examples are noticeably rarer than the company's CJ-2A conversions. 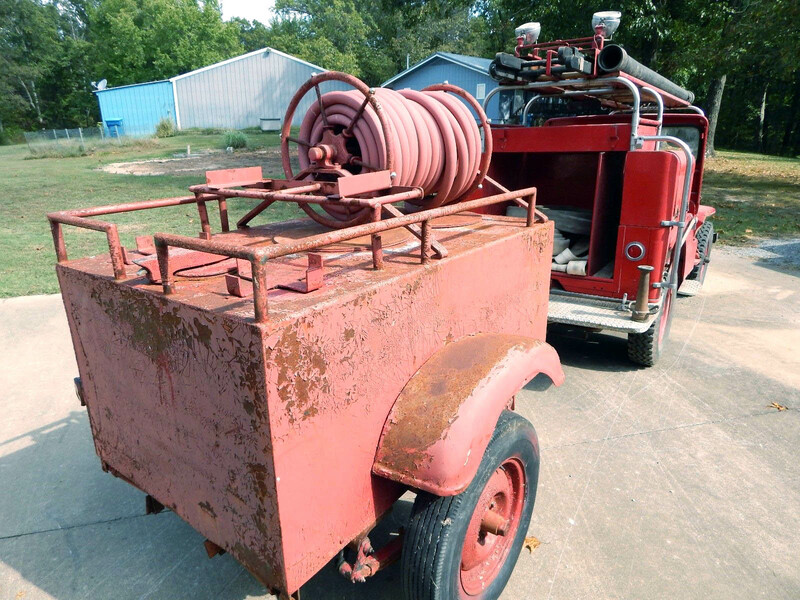 Finding a Boyer CJ-3A complete with equipment and water trailer, and less than 3200 miles on the odometer, doesn't happen every day. 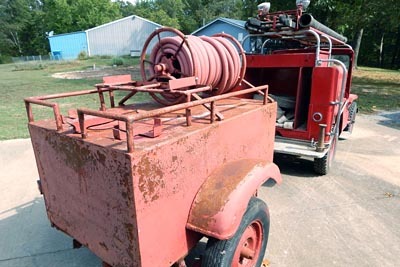 Jim Robbins in Arkansas purchased this 1949 3A last year, and is undertaking a restoration in 2019 for its 70th birthday. 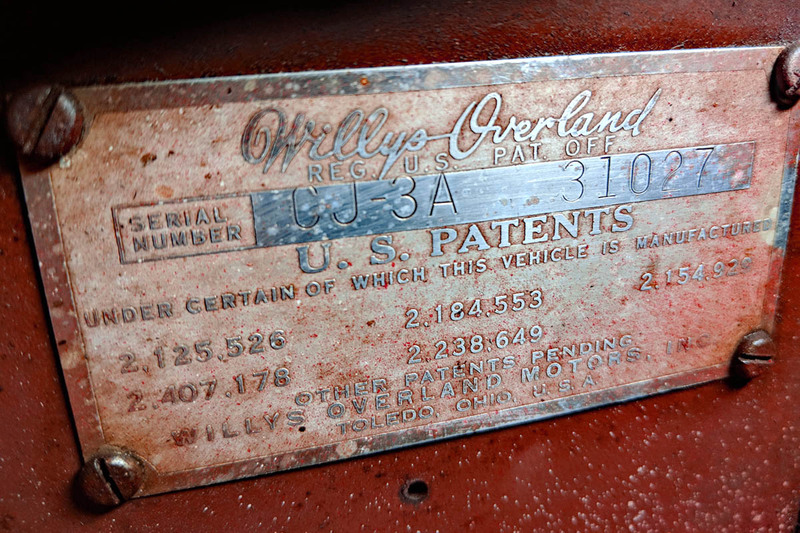 The Willys serial number plate (250K JPEG) reads 31027. 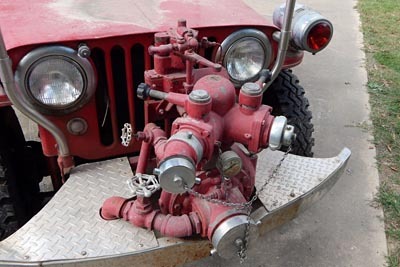 The Jeep has some unusual features, including the siren on the fender rather than the hood, and a pump with two separate valves on the siamese 2-1/2" discharge, like the pumps on some mid-50s fire Jeeps. Jim soon discovered that the Barton pump is not original to the Jeep. In fact this Barton A5081 was not yet in production in 1949, and appears to have replaced the earlier pump, probably a Barton U-40, sometime in the 1950s. See also the L-head engine (250K JPEG) including 6-volt battery, speed governor, and throttle cable from the front grille. Thanks to Dan Sharon at Classic Military Vehicles for the photos. The Federal siren could have been moved from the hood, but there are no holes in evidence there. Another unusual small detail is the fire axe, mounted at a downward angle like a Howe, rather than horizontally as Boyer typically did. Maybe Boyer was just as willing as Willys to make special-order changes, particularly for a government sale, or maybe they were just trying something different. 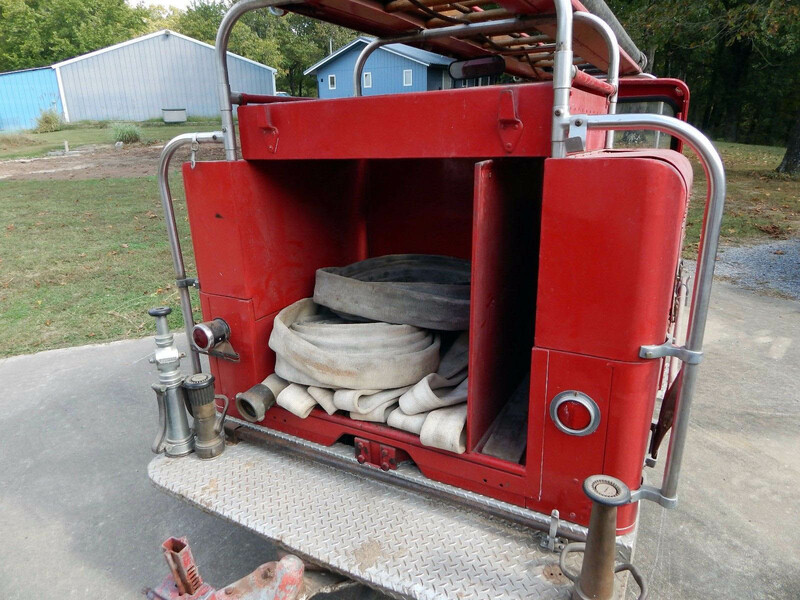 See also inside the storage compartment (280K JPEG) full of adapters and nozzles, and take a close look at the ladder and suction hose rack (200K JPEG) and the hose bed and rear step (370K JPEG). 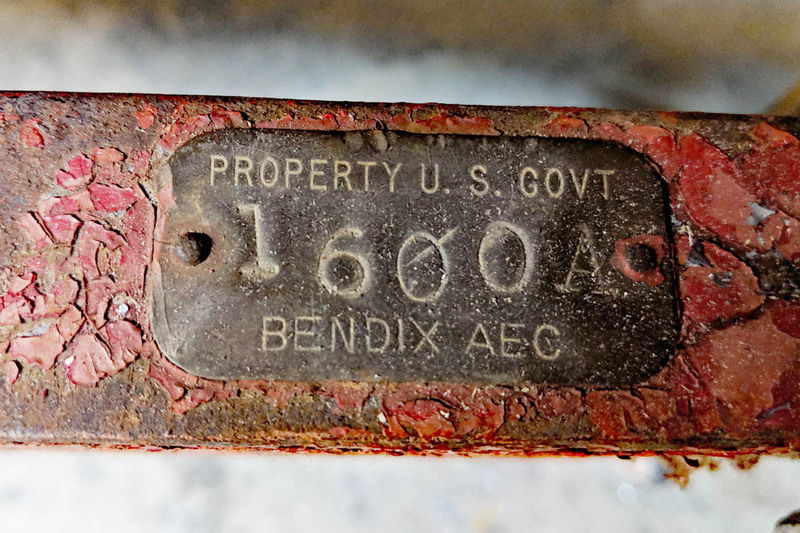 In 1949 the Atomic Energy Commission contracted the Bendix Corp. to make the non-nuclear parts of nuclear warheads in the plant, also called the Bannister Federal Complex. (5) They bought the little Boyer fire engine from Willys at a cost of $3,917.62, to provide emergency response in the facility. The sale to the AEC is confirmed in the Boyer Production List. But the job had outgrown the Jeep and its trailer, and documents indicate that by late 1956 they had been transferred to the government's Interagency Motor Pool in Kansas City. It's not known whether they saw any further active service, but reportedly they were located at the Bannister Federal Complex when sold as surplus in 1980. Apparently these seats haven't had much use for at least 40 years, and maybe more than 60 years. The dirty but otherwise perfect passsenger seat suggests that the Jeep was often manned by a crew of one. 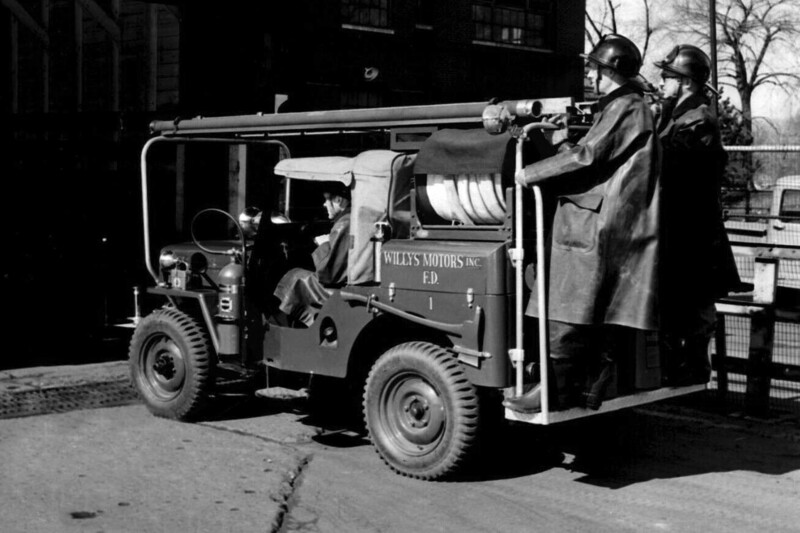 Or maybe like the Willys factory fire department in Toledo (50K JPEG) the Bendix crew found it more convenient to ride on the tailboard of the little Jeep. 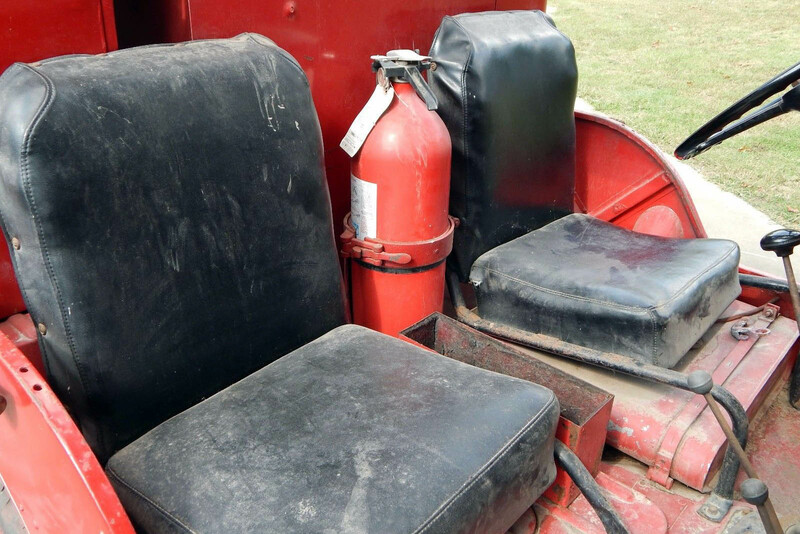 The dry powder extinguisher is probably a later replacement for an original soda-acid foam unit. 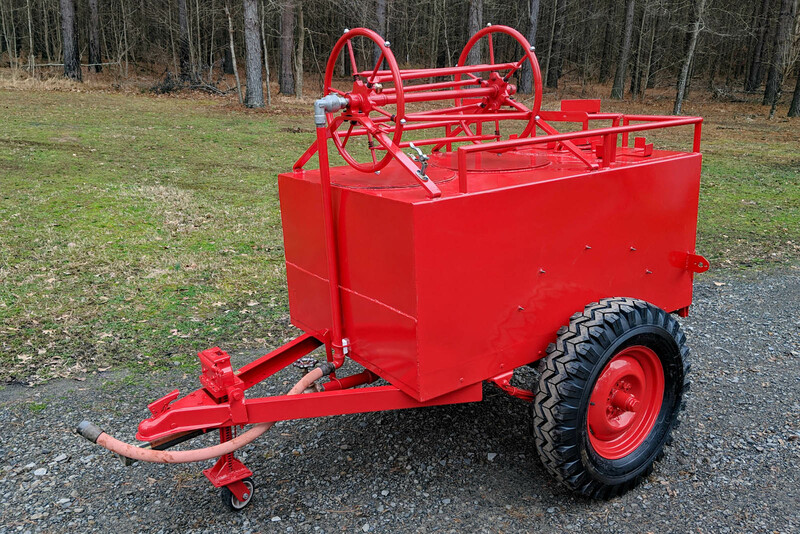 The trailer holds 300 gallons of water by volume, although Willys advertising for single axle tank trailers specified the capacity as 200 gallons, probably because of weight. It carries a Bendix AEC property tag (220K JPEG) with the same number as the Jeep, followed by a stamped "A". 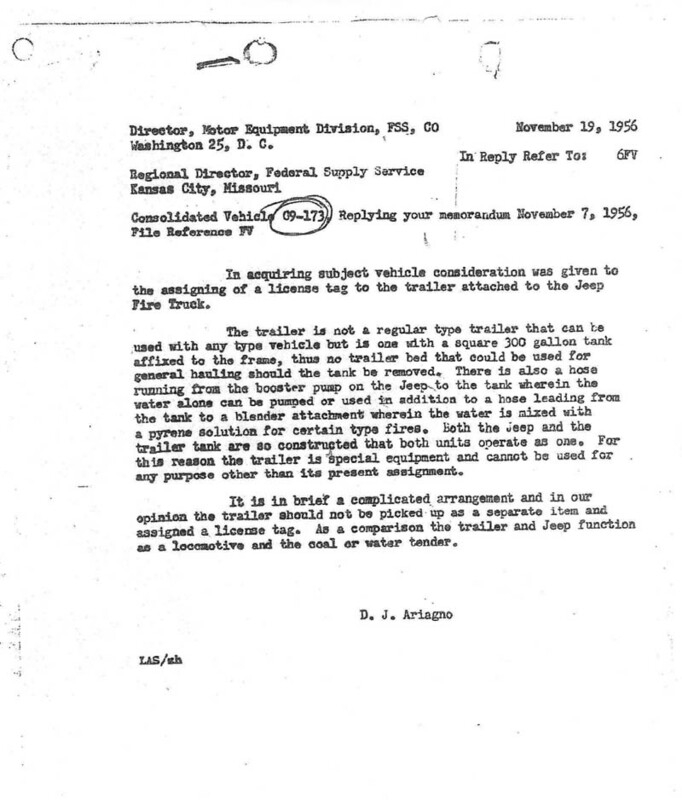 An interesting government memo (100K JPEG) written at the time it left the AEC in 1956, suggests that the Jeep and trailer be licensed as one vehicle because they were designed to operate as a unit, and it appears this decision resulted in the pair being kept together when they were later sold. The trailer was not stored inside after retirement, and picked up plenty of surface rust, but as of early 2019, Jim Robbins has had the trailer blasted and powder coated. Jim says, "I still have fenders that are quite rough and a tail light to be creative with. 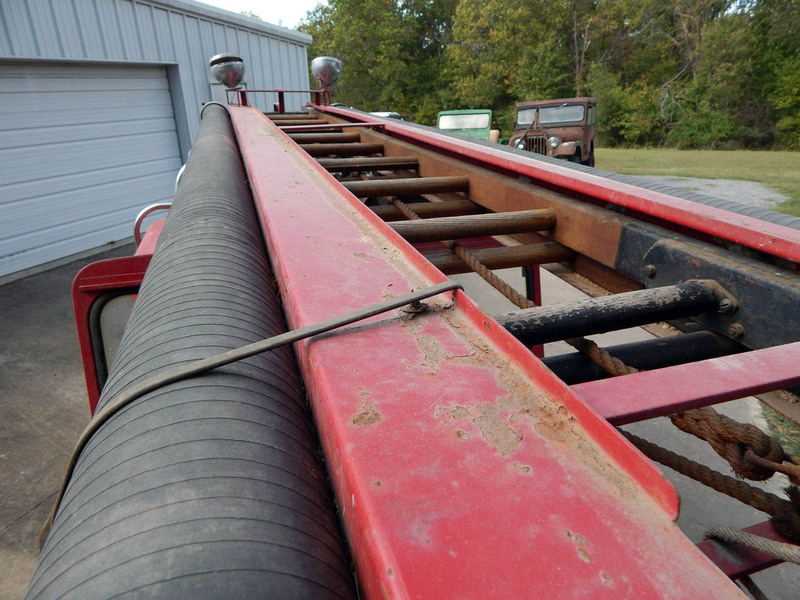 Come spring I will coat the insides of the tanker with truck bed liner material. This should seal and maintain the tank for years to come." According to the 1956 memo, there was also an attachment for mixing foam concentrate with the water being pumped from the tank, which may be the reason for the framework on top. 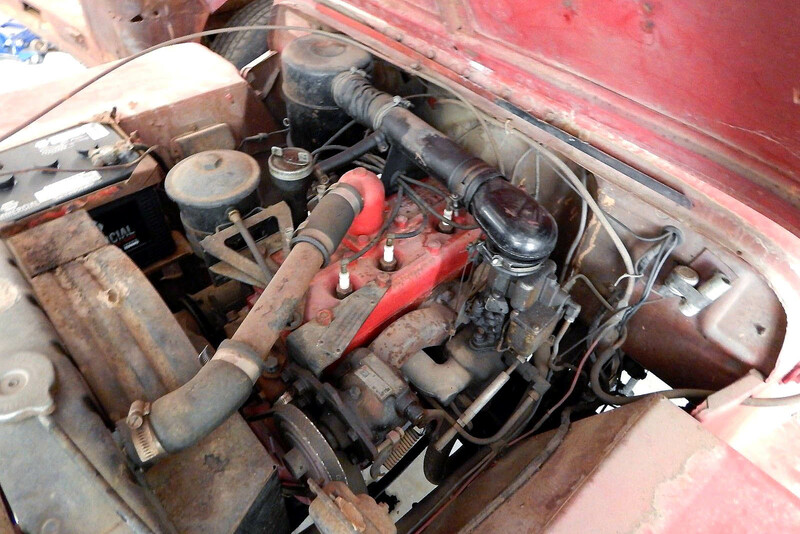 This retired BJ now belonging to Lindsay Clark is in restored condition with only 2726 miles on the odometer, but missing most of its original fittings and equipment. 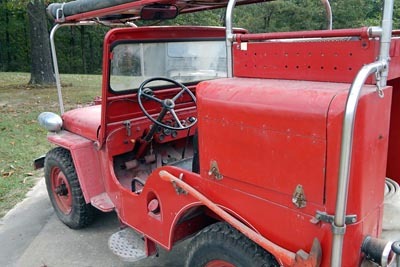 The 1950 CJ-3A, serial number 43168, was one of Boyer's last Universal Jeep conversions. The Boyer-installed front bumper still has the opening for the crankshaft-powered pump. 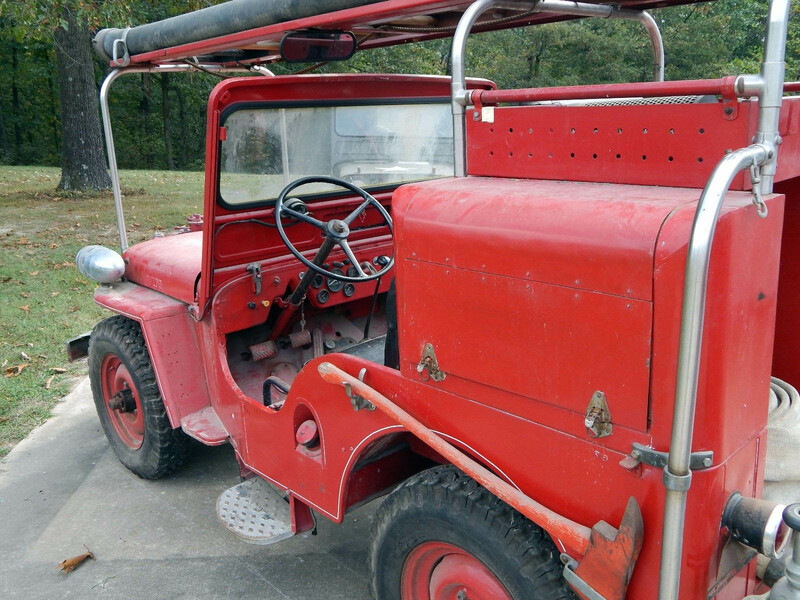 According to the Boyer Production List this Jeep was originally sold to Western Electric in New York in 1950. According to Rodger Birchfield, "This unit was delivered to Western Electric's plant on Indianapolis' east side for in-plant fire protection. It was probably purchased by the company's home office through Midwest Fire & Safety of Indianapolis, then representatives for Boyer. 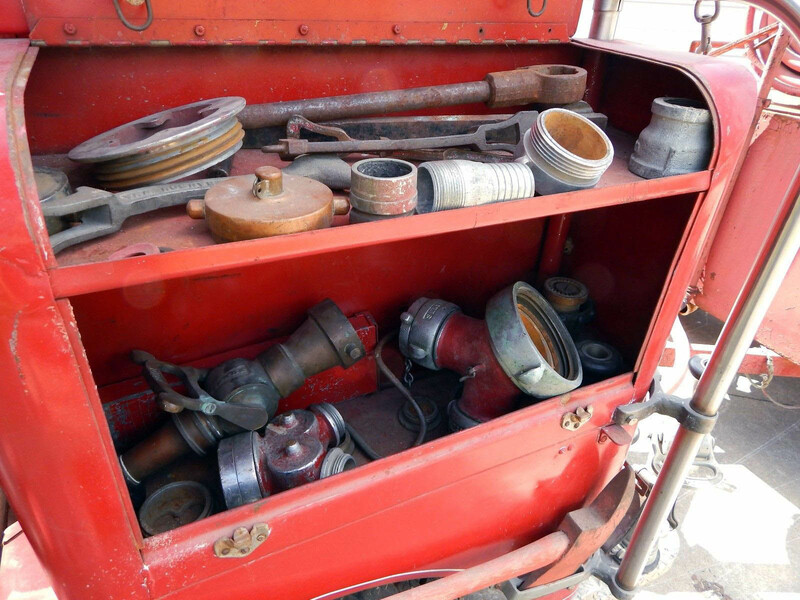 When the plant closed, the pumper complete with trailer went to a Western Electric campground in Virginia." 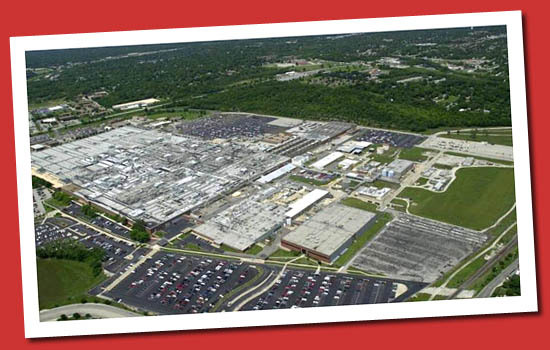 The Jeep was later acquired by an employee group at a Reading, Pennsylvania manufacturing plant. With a Surrey top and bench seat added, the Jeep was used in parades by the employees' clown troupe, the "Funatics". Photos courtesy of former owner Jon Wrap. See another interesting Boyer CJ-3A: Oak Spring No.1 sold at Sotheby's. Kansas City Plant at Wikipedia. 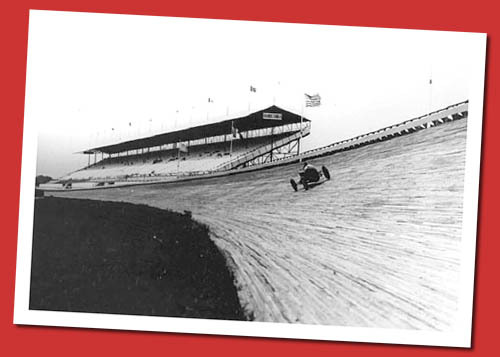 Photo courtesy Dale Snyder Collection. 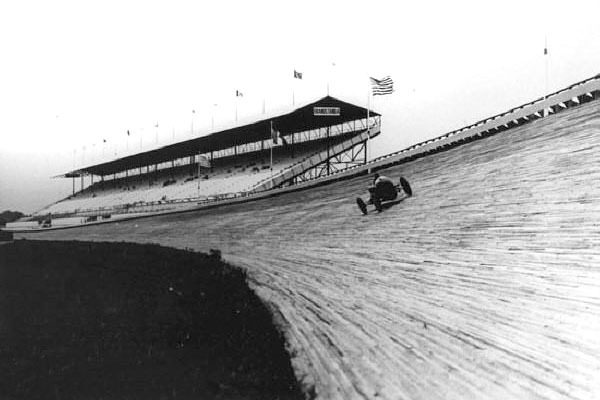 "The Greatest Display of Skill, Nerve, and Daring" at Kansas City Public Library. Pratt & Whitney R-2800 Double Wasp at Wikipedia. Photo courtesy The Kansas City Star . 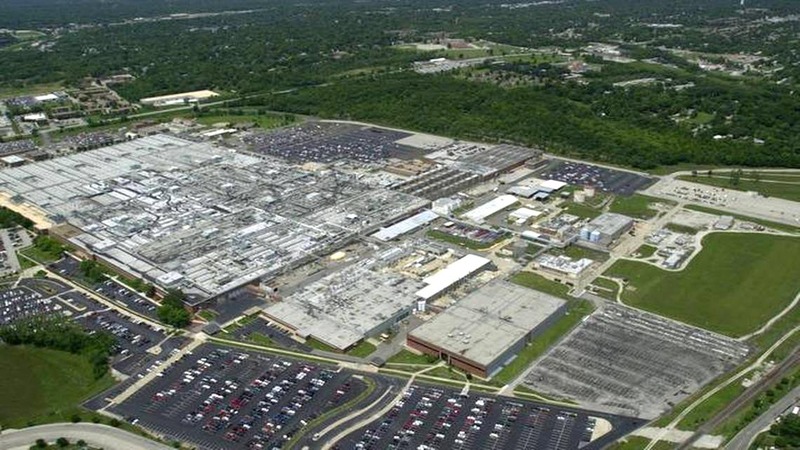 The Bendix Kansas City Plant at NukeWorker.com.